In November of 2012, 62% of Portland voters approved an Arts Education and Access Fund. The “arts tax” as it is commonly known was placed on the ballot by The Creative Advocacy Network and championed by then-Mayor Sam Adams. The City of Portland collects the tax and administers the funds. An independent citizen oversight committee reviews expenditures, progress and outcomes. Thanks to the arts tax, every elementary school in Portland’s six school districts (Centennial, David Douglas, Parkrose, Portland Public, Reynolds and Riverdale) now has at least one art, music or dance teacher on staff—91 teachers total. The AEAF funds one arts specialist for every 500 students. Up to 95% of RACC’s allocation helps provide general operating support for established nonprofit arts organizations. 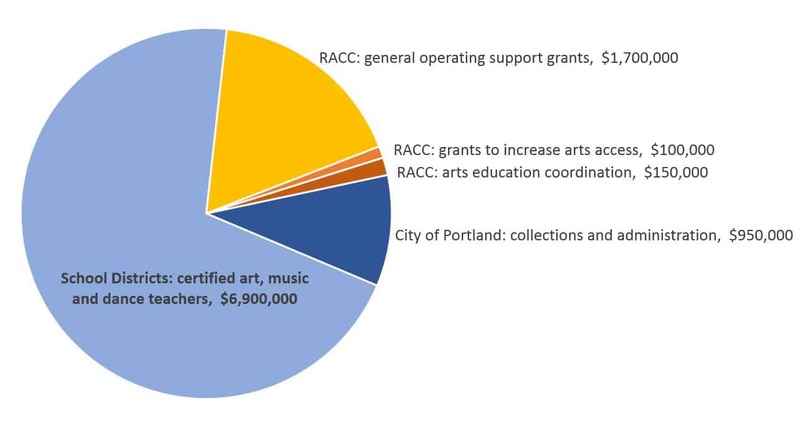 At least 5% of RACC’s allocation is set aside for grants that increase arts access for every Portland resident. RACC has indicated that it intends to spend more than 5% on these types of grants, starting in 2017. 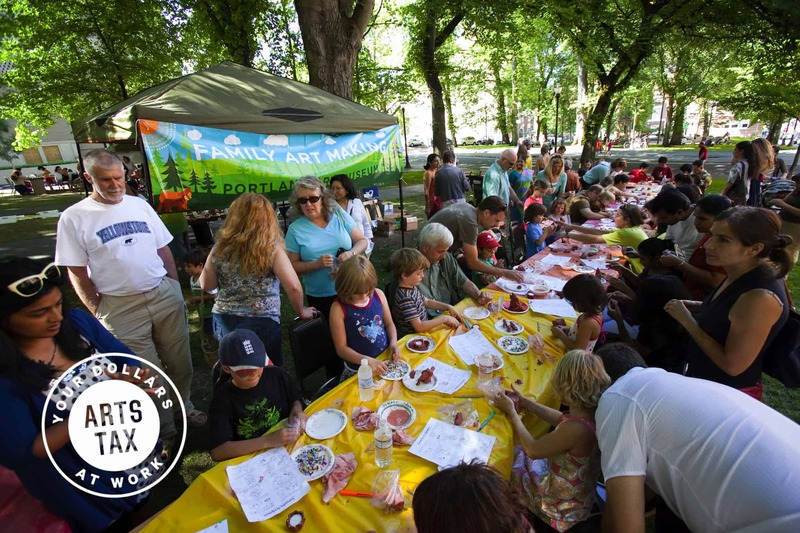 The AEAF also provides funds to help RACC coordinate and support arts specialists and other arts education activities in Portland’s six school districts. For a summary of grants that RACC has awarded to nonprofit organizations using AEAF funds, click here. To pay the arts tax, click here. Q: When is the arts tax due? The arts tax is due on the same day that federal income tax is due. This year taxes are due Tuesday, April 17, 2018. Q: Who pays the tax, and how much? Every Portland resident age 18 and older whose household income is above the federal poverty level and whose personal income (not including Social Security) is $1,000 or more pays the tax of $35. Other exemptions apply; visit http://www.portlandoregon.gov/revenue/61551 for details. Individuals file a separate tax return with the City of Portland at the same time that federal and state taxes are due. Q: Why was this fund needed? Without dedicated funding, arts education constantly finds itself on the chopping block. Between 2007 and 2011, many schools in the region reduced or eliminated their arts and music teaching staff. By 2011 there were only 31 arts specialists remaining in Portland, and 11,596 students attended a K-5 school that had no art, dance, drama or music instruction whatsoever. Today there are 91 arts specialists in Portland. Meanwhile, arts organizations in Portland receive significantly less public support than in other U.S. cities – about 2% locally vs. a national average of 5%. Public funding helps arts organizations sustain their programs and make creative experiences available for every resident. Q: How much is being raised? The arts tax raises approximately $10 million/year. Q: How is the money distributed? Q: How does RACC decide who receives funding from the arts tax? RACC distributes arts tax proceeds through three RACC grant programs: General Operating Support, Project Grants, and Capacity Building Grants for Culturally Specific Arts Organizations. RACC is also setting aside funds to help invest in equity initiatives within GOS organizations. Community volunteers evaluate all applications and recommend funding amounts to the RACC Board. For more information, including funding criteria, guidelines and deadlines, visit racc.org/grants. Prospective applicants are also encouraged to subscribe to Art Notes, the RACC e-newsletter, to receive monthly updates of all RACC opportunities and deadlines. Grants awarded by RACC include many sources of public and private funding—including City of Portland General Fund dollars, Work for Art workplace giving campaigns, special event proceeds, and funding from Clackamas, Multnomah and Washington Counties. An accounting of Arts Tax dollars only, from 2014 to 2017, appears in the Arts Tax Citizen Oversight Committee’s report to City Council (September 13, 2017) (see Appendix C). Do you have questions that aren’t addressed here? We invite you to submit your question to RACC and we will get back to you as soon as we can. We may even post your question (and our answer) to this page.